I hope someone will be able to tell me about this beautiful vase. The vase is surrounded front and back with beautiful flowers, birds,etc. It seems very old. 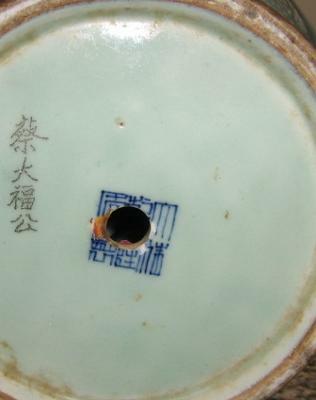 It has a mark but it's unclear because someone had at one time try to turn it into a lamp. There is also a Chinese character carving on it. I was told that typically the owner of the vase had carved their name on it. 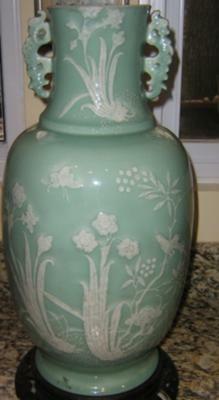 Comments for 19th Century Celadon vase? Thanks Peter and Kenny for your response! Hi, the bottom looks as if it had some age, but I doubt it is 19th century. What causes doubts is the style of painting, which is realistic like western paintings. And, this is the first time I see daffodils on Chinese ceramics. Could be 20th century, in my opinion, maybe second quarter? 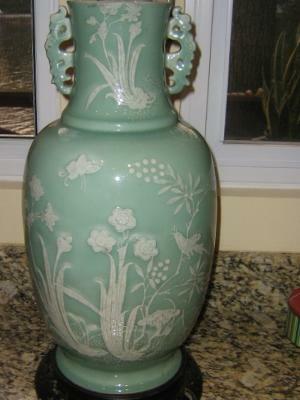 The most celadon vase I've ever see there is no floral object on it, so if this a really celadon with floral object, this is very interesting and have a high value, but let us hear the comment from Peter.